My computer situation has been iffy for the last few days. I have horrible allergies, and in trying to keep my symptoms manageable, I'm always dusting, vacuuming, and cleaning. I was in dust eradication mode last week when I decided to clean the inside of my computer. And instead of doing the sensible thing--using a soft brush or cloth to get the dust, my impatience got the better of me and I cleaned my hard drive's insides with the vacuum. Oops. I think I must have sucked up some important parts because now my computer only works periodically, and I'm bringing it in to be fixed tomorrow. I do have my mini-laptop to use, but all of my software and photos are on the big computer. Stupid allergies. I can cross bagel-making off my goal list. Where we live you can't even buy a decent bagel. The bagels around here are over sized and puffy, and do not have the characteristic chewy outsides. They taste more like doughnut shaped rolls than real bagels. I made two versions--a no-knead white flour version, and Peter Reinhart's super whole grain version. The whole grain version takes a couple days to make as there is a starter and a biga involved. The recipe is similar to the bread I made here. The recipe for the no-knead bagels is from Artisan Bread in Five Minutes a Day. This recipe makes 20 bagels, but you can halve it. Mix the yeast, salt, and sugar with the water in a 5-quart bowl or lidded (not airtight) food container. Mix in the flour without kneading, using your hands (or you can use a mixer). Cover, and allow to rest at room temperature until the dough rises and collapses, approximately 2 hours. Twenty minutes before baking time, preheat the oven to 400F, with a baking stone placed near the middle. Place an empty broiler tray on any other shelf that won't interfere with the rising bagels. Dust the surface of the cold dough with flour and cut off a 3-ounce piece of dough. Dust the piece with more flour and quickly shape it into a ball by stretching the surface of the dough around to the bottom on all four sides, rotating the ball a quarter-turn as you go. Bring a large saucepan or stockpot full of water to a boil. Reduce to a simmer and add the sugar and baking soda. Punch your thumb through the dough to form the hole. Ease it open with your fingers until the hole's diameter is about triple the width of the bagel wall. Remove them from the water, using the slotted spoon, and place on a clean kitchen towel that has been lightly dusted with flour. This will absorb some of the excess water from the bagels. 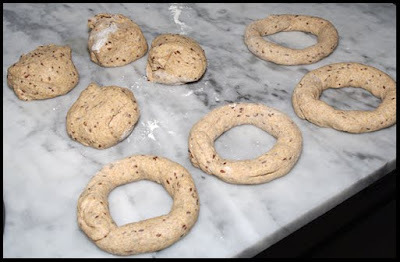 Then place them on a peel covered with whole wheat flour. 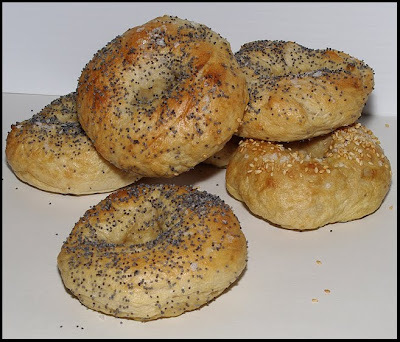 Sprinkle the bagels with your favorite seeds. 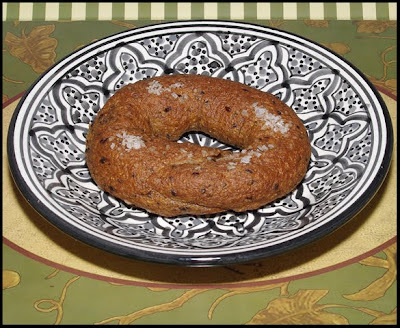 These are extra delicious served a bit warm--so much better than the grocery store bagels. Those look just perfect! They look like gourmet specialty bagels. Very impressive. I bet they were delicious! They look really good! Bagels that are like a big doughy roll are the worst. There are a couple of bagel shops around here that have decent bagels, but they aren't very close to my house. Now that I've been making more bread, I should really venture into bagel making.